Soooooo gorgeous! LOVING the colors and those butterflies!!!!!!! What a fun set Sherrie! Love it! What a gorgeous card and tag!! I love the pretty butterflies, the bright colors you used!! Have a great day. What a beautiful card and tag! I just love the pretty colors that you used! What a stunning set this is, Sherrie!! The colors are so amazing!! I love the beautiful butterflies and flower backgrounds!! These are so gorgeous and I absolutely adore them!! Super pretty set you created!! Beautiful colors and design!! What beautiful ink blending! Such a pretty card and tag. 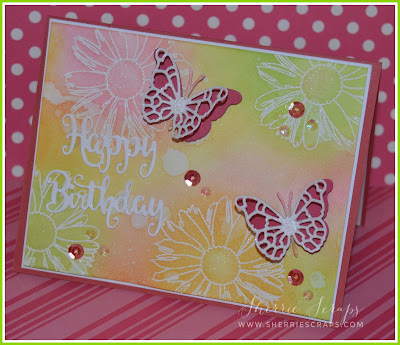 Sherrie, this is such a happy and fun beauty, Sweet colors, and great use of the butterflies. Love this beauty.. I LOVE your background! The colors are so pretty and I love the dies you chose! Such a pretty card! Great job! This set is so perfect for this time of year! Just screams spring with those flowers and happy colors. I love the Distress combo you used on the background, and the white embossing on the sentiment and flowers is so eye catching. Love how the butterflies pop off the page, too! Love these bright beautiful projects! So awesome Sherrie!! I love the colors on these and the way you did the butterflies! I love your pretty butterflies and and your background colors are so bright and cheery! 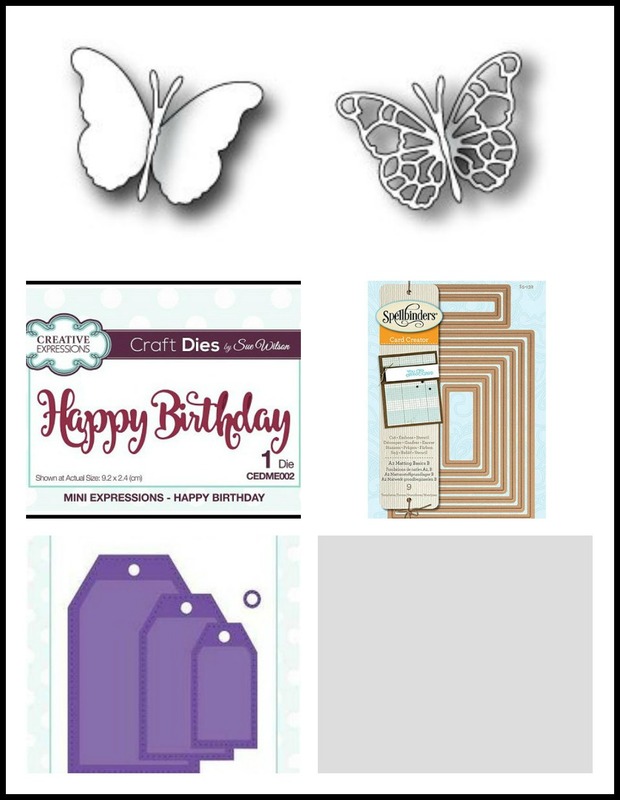 Gorgeous card and tag! Those butterflies are so pretty! 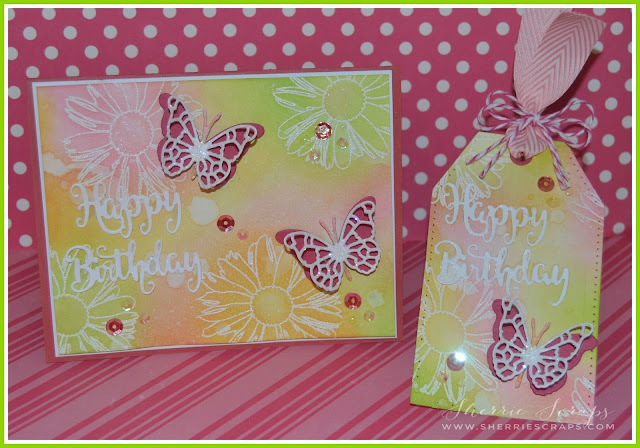 I love the pretty background you created and the embossing looks amazing! Love your card! And I love how you showcased the dies you used. WOW! So PRETTY Sherrie!! I LOVE the beautiful background and those gorgeous butterflies!!! The matching tag is fabulous! Beautiful birthday set! What a pretty background - just perfect for those butterflies! 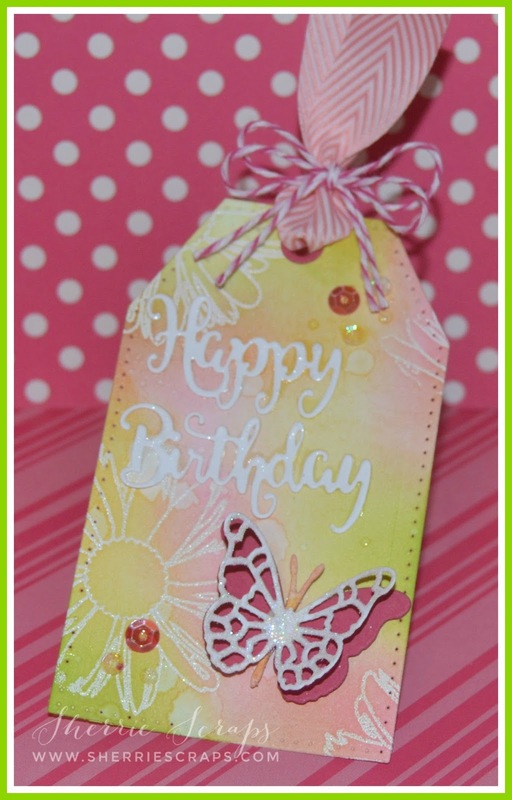 Such a beautiful Birthday card and tag! They make me smile, the colors are so happy, it reminds me of sherbet! Love this birthday combo! The colors are so bright and cheerful!! Super pretty! Perfect colors for this time of year and I just LOVE butterflies. I worked in my yard last weekend planting new butterfly flowers. Waiting for them to flutter around. Love those butterfly dies and your background you created is so pretty. What a Beautiful Card and Tag. Just Lovely! Wishing you a Happy Mother's Day! So very Beautiful Sherrie, love the butterflies! Such a gorgeous set!! I love the inked background and pretty colors.The butterflies are so pretty!I love butterflies! !You did an AMAZING job my friend! !